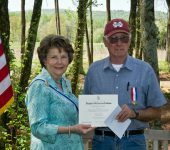 Huntsville Botanical Garden volunteer Vernon Bush has been presented the prestigious National Society Daughters of the American Revolution Conservation Award Medal and NSDAR Conservation Award Certificate for his epoch achievements in wildlife conservation. The NSDAR Conservation Medal is awarded to an adult with a distinguished volunteer conservation record. The criteria for issuance included outstanding efforts in wildlife and nature centers, using native plantings to attract birds and wildlife while providing them with: food, water, cover and places to raise their young. Vernon Bush retired in 1996 from a long and prosperous career as an Aerospace Engineer; he retired from the Thiokol Aerospace on Redstone Arsenal. Since then, Vernon has selflessly dedicated his time to the planting and cultivation of native plants and wildflowers. He currently volunteers at the Huntsville Botanical Garden on Tuesday, Thursday and Saturdays from 7:00 a.m. – 3:30 p.m. and the Nature Trail at Jackson County Park in Scottsboro, AL on Monday, Wednesday and Fridays from 7:00 a.m. – 3:30 p.m. Vernon propagates and preserves rare and endangered plants in both locations. 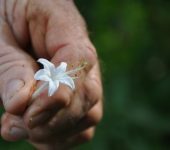 Some of the plants include pink lady’s slippers, Oconee bell, blue-eyed Mary and his specialties: native azaleas and rhododendron. Vernon created the Nature Trail at Jackson County Park in 1997. He grew the native azaleas that he planted from mere seeds or cuttings. The Trail has become a showplace of beauty, especially in the spring when the azalea and rhododendron bloom. The Jackson County Park has been planted with many unusual native wildflowers such as various species of trillium, native orchids, jack-in-the-pulpit, ginger as well as ferns and fern allies. Vernon designed and laid out the trails, built bridges, arbors and benches. Vernon began working on the Huntsville Botanical Garden Nature Trail in 1998. Many of the shrubs Vernon raised himself. He lined the Nature Trail with cedar that has since been replaced with sandstone rocks that Vernon personally picked out, hauled from Section, Alabama and placed along the trails. He also assisted in the building of two bog gardens in the Nature Trail. With the help of a few fellow “Garden Grubbers,” he cleared underbrush, weeds, etc. from an extended area of the trail, planting them with his native azaleas and rhododendron to become known as the Azalea Trail. Again, he developed trails and bridges to further develop the area. The DAR is not the first to recognize Mr. Bush’s achievements. In 1998, the Jackson County Park named the nature trail he created The Vernon Bush Trail at Jackson County Park in Scottsboro, AL. He was also named Volunteer of the Year at the Huntsville Botanical Garden in 2005. Vernon was also the first recipient and the namesake of the Vernon Bush Distinguished Service Award at the Garden in 2011. Mr. Bush was unable to attend the state presentation of the NSDAR Conservation Award, therefore the Alabama Society DAR State Regent Marguerite Poole Horton presented the award to Vernon Bush at 11:00 a.m. on Tuesday, March 27 at the Huntsville Botanical Garden by the Azalea Trail established by Mr. Bush.